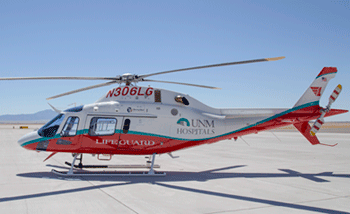 If you or your child experience a critical illness or injury – even when you're far from a hospital – The University of New Mexico Hospital's Lifeguard Air Emergency Services is here to help you. Our expert team of onboard emergency medical personnel operates 24/7 under advanced treatment protocols. You or your loved one will be transported in a Lifeguard helicopter or airplane, or a critical care ground ambulance. The Lifeguard Air Emergency Services crew is comprised of emergency medicine physicians, paramedics and registered nurses with emergency, intensive care unit and critical care experience. The Lifeguard Children’s Specialty Team includes registered nurses, registered respiratory therapists and neonatal practitioners, all with neonatal or pediatric intensive care experience. A King Air B200 that can fly more than 1,000 miles per trip at up to 322 mph. Dedicated craft for the neonatal team. Helicopter transports are completed in an AW119. In some cases, a family member can ride along with the patient. A full emergency services or specialty team will be waiting to immediately take over your care when you arrive at the hospital. 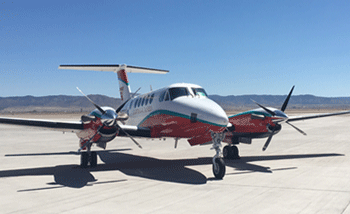 Lifeguard most often transports patients throughout New Mexico, eastern Arizona, southeastern Utah, southern Colorado and western Texas. Depending on your needs, you could be transported to and from other areas, such as health care facilities in California and Oklahoma. Explore information about Lifeguard employment, training and certification. 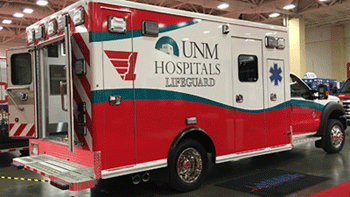 The Commission on Accreditation of Medical Transport Systems will conduct an accreditation site visit of the UNMH Lifeguard Air Emergency Services on March 18-19, 2019. For more information on Lifeguard, send us an email.